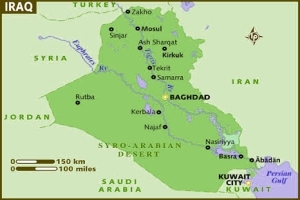 2003 was the year that the United States “liberated” Iraq. Let us assume, just for the sake of discussion, that the WMD theory was more of a plot or a deliberate lie than a genuine mistake. If so, what for? What purpose or reason would be so detrimental as to drive the Americans to invade the country? Only one answer would enter the minds of geo-political strategists, intellectuals, and globalists. This answer – or theory – brings back the idea of Manifest Destiny. It was an idea floating amongst early Americans, in the 19th Century, that put an importance on global freedom and democratic principles. According to these Americans, it was the responsibility of the new United States of America to enforce these global democratic principles. The term is no longer in use today, but the idea may still be alive and well. The importance of oil in the maintenance of our way of life also plays an important role in what may be an intricate, well planned, long term geo-political strategy to eliminate the most powerful and threatening force in the Middle East: Iran. Not only is Iran a threat to democracy across the region, it is a threat to the West and Europe's long term flow of affordable oil. On the south coast of Iran lies the Strait Of Hormuz. It has been the source for several news stories over the years; particularly when Iran threatens to create a blockade in the strait and cut off the flow of oil to surrounding regions, including the United States. Iran's significant military presence in the strait has been the bane of America's existence since the Reagan era. This important strait represents 33% of the world's sea-based oil shipments. Along with oil, the strait is often used to transport several other resources from surrounding countries. If this strait were actually blocked, it would have dangerous consequences for the global economy. Upon any actual military strike against Iran, either by the U.S. or Israel, it is likely that Iran would blockade the strait. While such a war were taking place, our flow of oil would be compromised, Europe's economy would suffer, and we would need alternative sources to keep our military efficiency at a maximum. The goal of any war against Iran would be to first keep the blockage of oil at a minimum and to reduce the amount of time such a blockade would last. The best way to do this is to secure the other regions around the strait while also securing better striking positions against Iran. Positions in which to strike Iran have already been secured: Iraq and Afghanistan, both of which border Iran on the East and West. While Saddam Hussein was in power, he never allowed the presence of U.S. military bases on Iraqi soil and he always kept America's military personnel at a bare minimum. The Taliban did not allow any American troops or personnel on Afghan soil at any time. Of course, all of that has now changed. The new America-friendly democracies that have been established in both countries will likely aid in any military actions against Iran. A fully democratized Middle East would not only be beneficial to the Middle East, it would be beneficial for the world in general. Transparent democracies, as opposed to cloaked dictatorships, are beneficial to global economics and peace. This is probably not just the view of American neo-conservatives, but the general view of most Americans. However, attaining such a goal is where the real challenge lies. If the United States and the Bush administration did, in fact, deliberately deceive the American people into accepting a war in Iraq, perhaps the intent was less sinister and less malevolent than most conspiracy theorists might have us believe. Or, maybe, the whole WMD charade was the result of a massive, far reaching case of viral incompetence. Maybe it was just a huge mistake. Regardless of whether the Iraq war was a mistake or a deliberate plan, the fact remains that the United States now has an advantage over Iran that it did not have in 2002. With America-friendly Turkey to the North, Iraq to the West, Afghanistan to the East, and the United Arab Emirates and Saudi Arabia to the South, Iran is now surrounded. Iran has been successfully cordoned off. Some may argue that democracy cannot be forced. Those same people have failed to see the non-sense behind the idea that democracy can come about any other way. Democracy, whether by the people of a nation or by the military of another nation, has always been brought about through force. There is always a leader or dictator who will refuse to give up power. This leader is almost always removed against his will, by force. Whether it is through the force of the people or through the force of some external military action, most democracies in recent history were formed by some sort of brutal, physical force. This includes the American Revolution. It also includes the Libyan revolution, the Egyptian revolution, and the upcoming Syrian revolution. What happens next will be what reveals the U.S.'s true long term foreign policy. From the Strait Of Hormuz to the Arctic, whether we like it or not, some world superpower will control these strategic geographical regions. The question to most people is: who would you rather it be? Communist China? The Russians? Iran or some other extremist nation? The options are, apparently, limited. If you believe that strategic regions should be controlled by “the people” or by an entity that supports human rights, then you are likely on the side of a democratically elected superpower that supports individual freedom and prosperity.